This highly prized plant oil really lives up to its reputation with its rejuvenating properties. We know that it can be bewildering to make sense of all the different claims about plant oils. 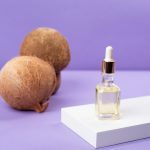 While different seed oils can make great additions to anyone’s beauty routine, it can be hard to tell which ones you should invest in, when beauty websites are screaming at you that you need every single one. As an informed beauty buyer, it’s best to tailor your purchases to your specific skin type. 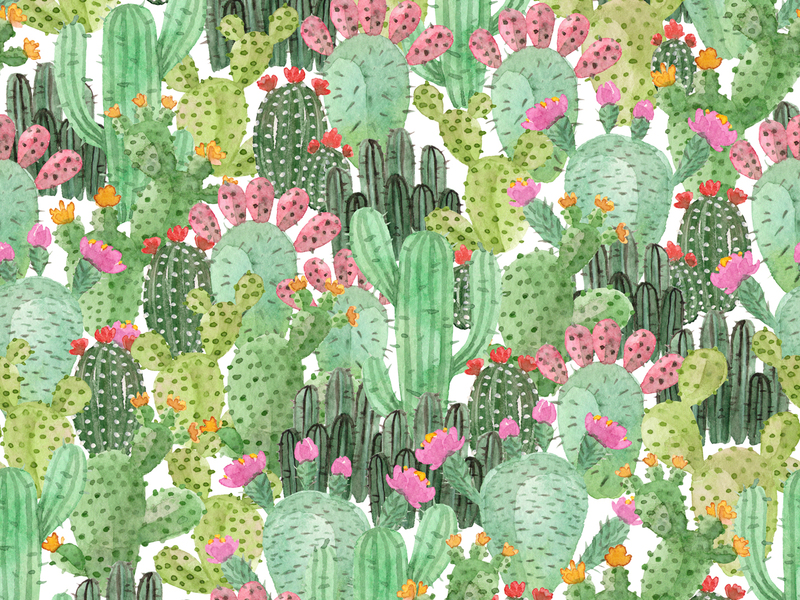 That’s why we’ve created this guide to prickly pear oil, one of the many plant oils out there. 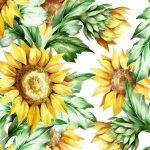 We’ve compiled all the information you need—from where this seed oil comes from, to how to use it—so that you can make the right decision for your skin. Prickly pear oil is extracted from the seed of the prickly pear cactus, a cactus variety so beloved that it appears on the Mexican flag. The prickly pear cactus bears gorgeous, pink blossoms and fruit, and flourishes in many parts of the globe: from arid regions of the Americas, to parts of Africa, Australia, and the Mediterranean. Over the centuries, this cactus has been used for many purposes. Not only has it been eaten and used to treat stomach problems. It’s even been used to make paint! In a fascinating turn of events, scientists are also considering ways to use this cactus as a sustainable energy source. Pure prickly pear seed oil tends to sell for high prices, and this is for a good reason. The seeds of the prickly pear fruit are tiny in size, and each one contains a very low concentration of oil, so the process of harvesting oil is extremely labor-intensive. About half a ton of seeds needs to be cold-pressed in order to make just a liter of prickly pear seed oil! If you choose to buy a pure prickly pear seed oil, we recommend searching for an option that’s certified organic, and that comes from a company that follows fair trade practices. One of our favorites is Kahina Giving Beauty’s Prickly Pear Seed Oil, which is made in small batches at a co-op in Mexico. You can also purchase their Prickly Pear Seed Oil Rollerball for super-smooth, easy application. While purchasing pure prickly pear seed oil isn’t usually budget-friendly, there are still plenty of ways to incorporate this ingredient in your beauty regimen. Below, we’ll discuss the benefits of prickly pear oil for skin, our favorite prickly pear products, and DIY ideas for using prickly pear oil. Prickly pear oil is full of essential fatty acids (including oleic acid and linoleic acid), which help to hydrate the skin, promote healing, and lock in moisture. Due to its high concentration of fatty acids, prickly pear oil is an excellent ingredient when it comes to moisturizing the skin. And unlike some of the other oils out there that are renowned for their moisturizing properties (coconut oil, we’re looking at you), prickly pear oil is non-comedogenic, meaning it won’t clog your pores. Prickly pear oil’s moisturizing properties, combined with its non-comedogenic properties, make it an excellent option for combination skin types. 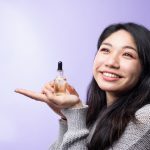 Youth to the People’s Superberry Hydrate and Glow Oil: This face oil combines hydrating prickly pear with other beneficial ingredients—including antioxidant-rich maqui, acai, and goji berries—to deeply nourish your skin. The antioxidant content of these berries, combined with the high fatty acid content of the prickly pear oil, will work to heal damage from dryness as the formula delivers deep moisture to your skin. Herbivore Botanicals’ Moon Fruit Superfruit Night Treatment: This intensive night treatment deeply moisturizes your skin while you sleep, using a combination of superfruit oils, kokum and shea butters, aloe juice, and hyaluronic acid. It also contains a blend of fruit enzymes to gently exfoliate your face overnight, so you’ll wake up with silky-soft, hydrated, healthy-looking skin. To use this night treatment, blend the cream thoroughly into your skin before applying a nighttime face oil. If you decide to buy a pure prickly pear oil, you can easily make a DIY moisturizer with prickly pear oil. Just combine ½ cup of organic aloe vera gel, 5 drops of prickly pear oil, and 5 drops of a carrier oil such as sweet almond oil or jojoba oil. Mix the ingredients together in a sterilized bottle or jar, and store your new, DIY moisturizer in the fridge to preserve its shelf life. 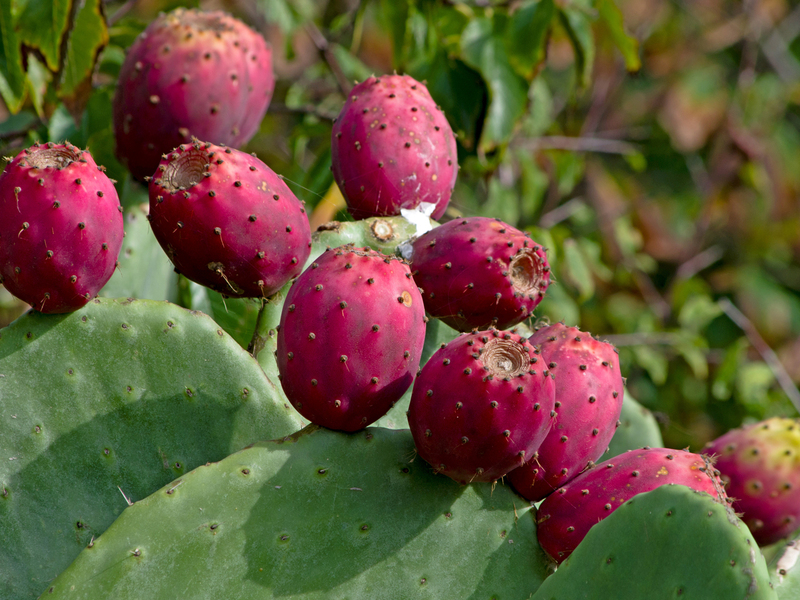 Prickly pear oil also has powerful, anti-aging properties. This is partially thanks to its amino acid content. These acids help to stimulate collagen production, improving elasticity and preventing the formation of fine lines and wrinkles. It’s also rich in antioxidants (including vitamin E) which fight free radicals in your skin to heal and prevent damage. Due its high concentration of these healthy components, prickly pear oil can help to improve the texture and tone of your skin, making it appear plumper, smoother, and more youthful. Root Science’s Restore Face Serum: This face serum features a blend of natural oils that work together to fight against aging and skin damage. It uses rosehip seed CO2 extract to encourage cell renewal, tamanu oil to diminish the signs of skin damage, argan oil to bolster the skin’s barrier function, and carrot seed oil to brighten the skin. This product can be used after cleansing and toning. Mun’s Aknari Brightening Youth Serum: This rejuvenating serum can be used during the day at night, and can be used as an under-eye treatment as well as a full-face serum. Along with prickly pear oil, it contains argan oil and rose essential oil to give your skin a youthful, dreamy texture and glow. The product boasts an impressive shelf-life of two years, making it a great long-term investment. It’s also sustainably sourced and vegan. Application is easy, too: the serum can simply be dabbed onto the skin after cleansing. The antioxidants in prickly pear oil make it effective at combating different types of skin damage. Antioxidants help to fight free radicals—byproducts of cells’ metabolic functions that can have a toxic effect if they accumulate in excess. The production of excess free radicals can be caused by environmental factors, diet, and smoking, and can cause cellular damage over time if they’re not kept in check. That’s why prickly pear oil is such a great option for fighting skin damage. Its antioxidants prevent damage at the root cause, even as other components such as fatty acids help to promote healing. Evanhealy’s Blue Cactus Beauty Elixir: This USDA-certified organic elixir fights various skin woes at their root causes, making it an excellent all-around treatment for various skin types and skin conditions. It’s especially effective when it comes to revitalizing irritated, sensitive, and dry skin. It can also be used to treat skin damage associated with aging, such as fine lines, hyperpigmentation, and dark spots. To use it, you can simply massage 3-4 drops into your skin. Lotus Moon’s Pear + Strawberry Beauty Oil: This beauty oil helps to restore the skin’s natural barrier function, protecting your skin from future damage while it repairs existing damage. Along with prickly pear oil, it features strawberry seed oil for its high vitamin content, and jojoba oil to smooth and heal the skin. To use it, you can add a couple of drops to your favorite moisturizer, or lightly massage a couple of drops directly into your skin. Prickly pear oil can also help to brighten dark under-eye circles. Its blend of powerful nutrients deeply nourishes the skin, brightening it and fading away grayness. Meanwhile, the fatty acids in this seed oil work to hydrate the under-eye skin, while antioxidants stimulate healthy cell turnover, resulting in a brighter, healthier-looking eye-area. To brighten dark under-eye circles using prickly pear oil, you can try applying a drop or two of pure prickly pear oil underneath your eyes. You could also use Mun’s Aknari Brightening Youth Serum, mentioned above. The many nutrients contained in prickly pear oil, combined with its gentleness, make it an excellent ingredient in sensitive skin cleansers. When used as or in a cleanser, prickly pear oil helps to remove dirt from the surface of your skin while delivering deep nourishment. 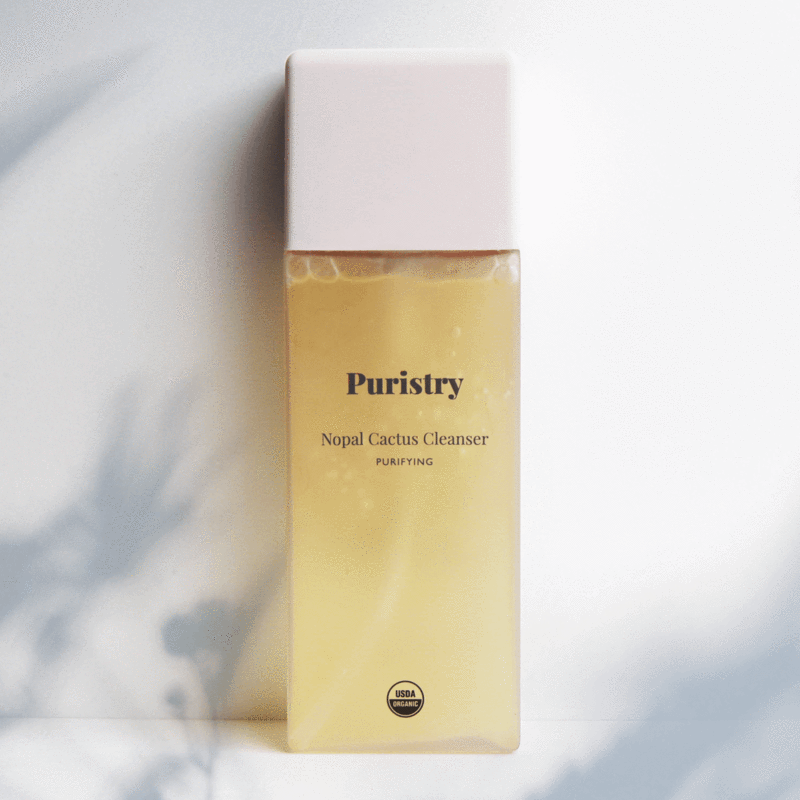 Our favorite prickly pear cleanser is Puristry’s Nopal Cactus Cleanser. This cleanser works smarter, not harder, to clean your skin without stripping it of its natural oils. It uses prickly pear to hydrate and soothe sensitive skin, alongside yuzu citrus to brighten and revitalize the skin. To use it, just massage one pump of cleanser into wet skin for 10-20 seconds, and then rinse it away. You can also make your own DIY prickly pear oil cleanser by combining ½ teaspoon of prickly pear oil with 1 tablespoon of jojoba oil. Mix the ingredients well, and store them in a sterile bottle or jar. You can use your DIY oil cleanser as the first step in a double cleansing routine. Start by massaging the oil cleanser into your face, then gently wipe it away with a warm washcloth. Follow up with a cream cleanser to wash away any residue. Prickly pear oil is a dynamic, effective ingredient when it comes to healing skin damage, promoting hydration and brightness, and fighting the signs of aging. We recommend it to anyone with stressed-out, dull, or mature skin. For mature skin, we recommend pairing it with rosehip oil to get an even more powerful effect. How will you use this skin-rejuvenating oil?